Meet a new version of HarePoint Analytics for SharePoint! 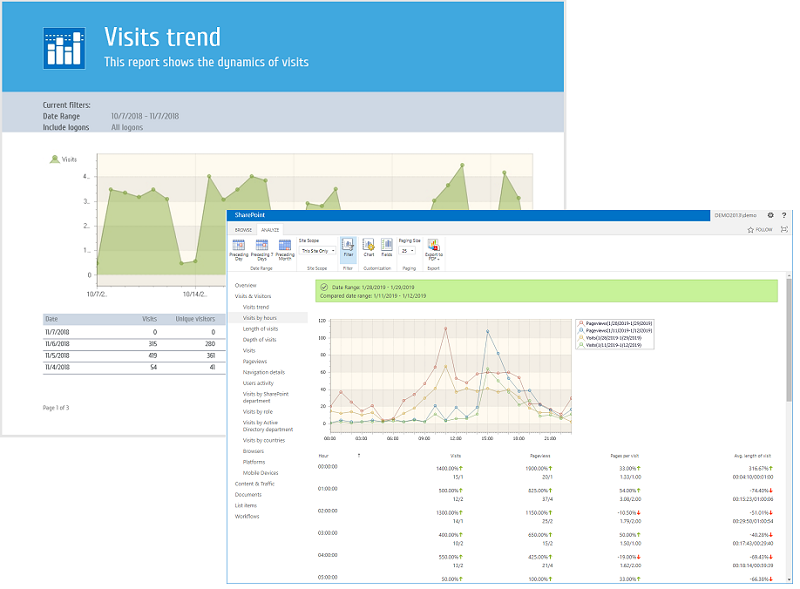 We are happy to present a new version of HarePoint Analytics for SharePoint - the leading software solution for tracking and reporting regarding all aspects of your SharePoint sites usage: traffic and trends, user behaviour, content utilization and much more. In the presented version, we would like to emphasize a new design for fonts and chart in all reports: the report layout becomes more demonstrative and accented to the most important items. Also, we have updated the layout for all reports exported to PDF; new color scheme, fonts and charts provide you the ideal document for presentations, reporting and so on. the functionality of changing the data range in the product reports while working with drilldown feature have been turned off - you can setup and change data range settings in the 'Filters' pane only. You are welcome to get the new version of the product on the HarePoint Analytics for SharePoint homepage.